Lower Clopton Farm situated at the foot of Meon Hill south of Stratford-upon-Avon, rear 2,000 traditional Christmas turkeys. All the farms’ turkeys are free range and able to forage around in the fields behind the house, allowing the birds to develop their flavour and much firmer meat with real texture. 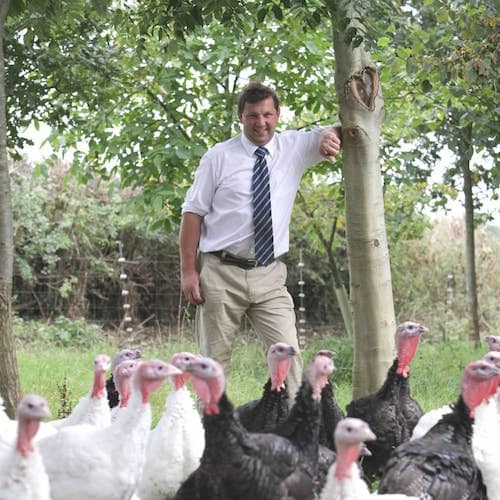 The birds are labelled Totally Traditional Turkeys, as a member of the Traditional Farmfresh Turkey Association, Richard guarantees that the birds are grown slowly to full maturity with plenty of space good welfare, access to the great outdoors and fed on a natural diet. They are also dry plucked and game hung for at least seven days to bring out the full flavour.